My husband and I have really been trying to move towards experience based gifts. As we work towards more simplicity in our lives, we are becoming much more intentional about making memories rather than collecting things. In our family, the adults don't exchange Christmas gifts. We do, however, always buy something for the grandparents from Miss. E. This year we did something a little different. Miss. 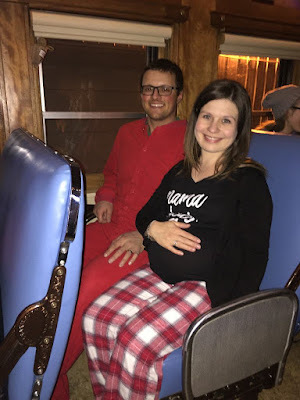 E took both sets of her grandparents on the Polar Express in Stettler, Alberta. I booked our tickets on the week that they became available. I was only able to attend the opening weekend, so I booked us on one of the Saturday trains. I booked by phone, as they don't do online bookings. The person I spoke to was courteous and efficient. Our tickets arrived shortly after in the mail and I made sure to put them in a very safe spot. 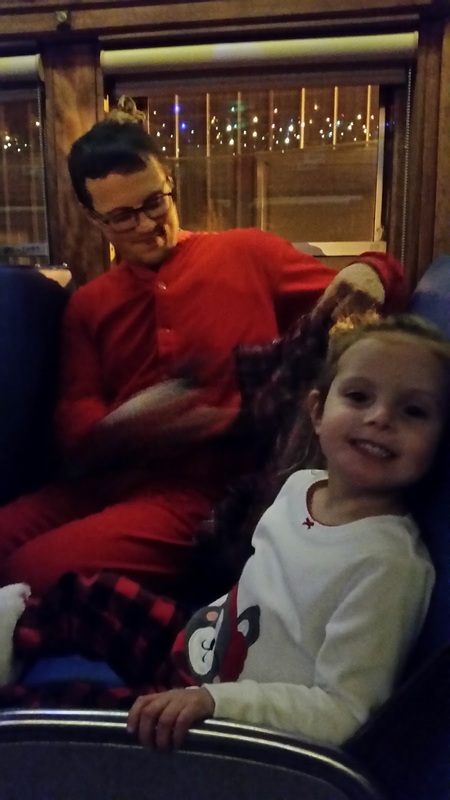 The person I spoke to gave me all the information that I would need and told me that we were encouraged to wear our pajamas on the train. (Just like in the book or movie.) I made sure to pass that information along to the grandparents, who all agreed to join in on the fun! Hubby's parents came down the night before and we had a lovely time catching up with them. On the day of the train ride, we all piled into my Jeep (I truly have easy-going, wonderful in-laws) and headed to Stettler. Stettler is a 2.5 hour drive from where we live. We had supper before we went to the train. It felt a little strange to be out dining in our pajamas, but the restaurant workers seemed to know that we were headed to the Polar Express. The train station was well set up with bathrooms available to all the guests. I quickly ran to bathroom with Miss. E. Bathrooms are super important to a 36 week pregnant lady and a 3 year old! They had warm up tents available for the guests so we didn't have to stand out in the cold. (Although, it was unseasonably warm that day.) The experience began right away when a goofy "hobo" character approached my daughter and asked her to trade her ticket for a radish. We politely declined and he moved about the crowd, asking all of the children to make the trade with him. We boarded the train and the inside was delightfully decorated in holiday decor. There were lights, tinsel and Christmas music playing in the background. 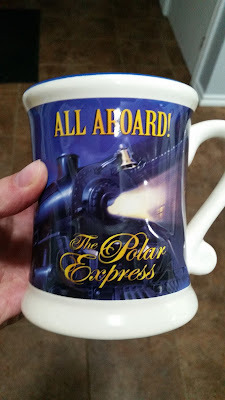 The train ride included hot chocolate in a beautiful souvenir mug, a cookie (which my Dad traded with the 'Hobo' for a radish), dancing and singing from the crew and a lovely retelling of The Polar Express, by Chris Van Allsburg. We each received our golden ticket for the North Pole which was stamped with the word 'Believe'. When we arrived at the North Pole we saw thousands of twinkling lights, the North Pole workshops, Santa, Santa's sleigh and the Elves. Everything was magical and Miss. E was so enthralled with the Christmas lights. Santa then boarded the train and gave each child a sleigh bell. Miss. 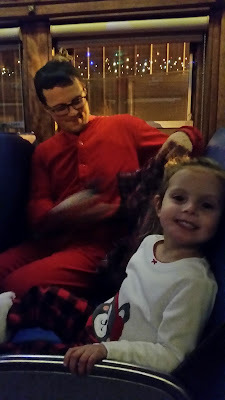 E is usually afraid of Santa but did really well. Santa was very kind and jolly. As we headed back to Stettler, we were given songbooks so that we could sing along with the Christmas carols. 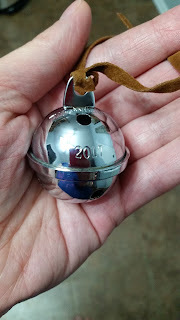 All of the children were having a blast, wildly jingling their sleigh bells to the music. 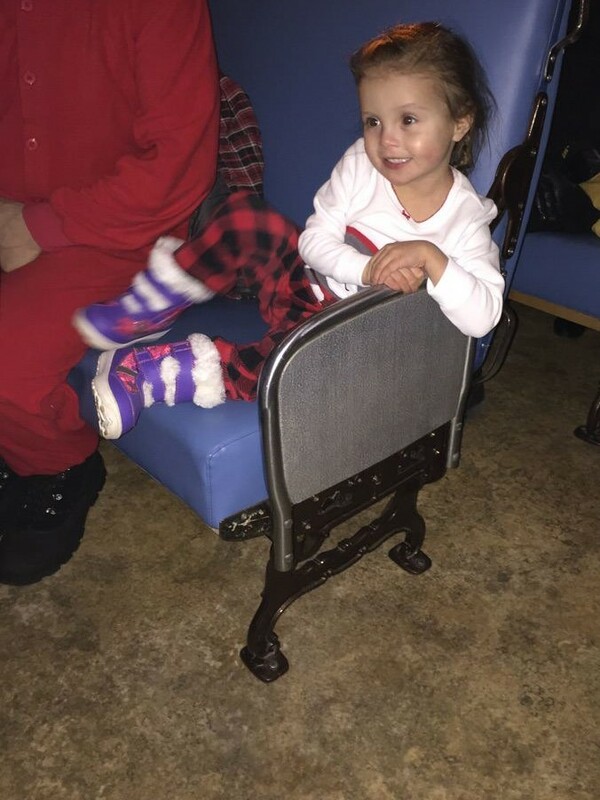 We had a magical time on the Polar Express and would highly recommend going. Miss. E had so much fun with all of the sights and sounds and her grandparents thoroughly enjoyed sharing the experience with her. It is such a fun family outing and a well-run one at that. I am thankful that the crew on the Polar Express was intent on making everyone's experience absolutely enchanting.